Russell Armand Mayeur was born September 30, 1927. He passed away on Thursday, January 24, 2019, at home surrounded by his family. He is preceded in death by his parents, Elizabeth Flick Mayeur & Edward Frank Mayeur, his brothers, Edward, Arthur, Joseph, Robert & Raymond Mayeur. Survived by his beloved wife, Eloise Kelly Mayeur for the past 74 years. Father of Russell A. Mayeur, Jr. (Judy, deceased), Ellen Mayeur McCubbin (Terry), Eloise Mayeur Carboni (Lou), Kelly Mayeur Feraud (Darryl), and Kerry Edward Mayeur (Heather). Grandfather of 14, Great-grandfather of 19 and Great-great-grandfather of 1. He attended Our Lady Star of the Sea Grammar School & Warren Easton High School. He was a charter member of the Krewe of Pegasus and the Krewe of Caesar serving both organizations as President & Officer. His Community Service includes: St. Bernard Kiwanis Club – 20 years & Past President. He was awarded twice the Outstanding Member of the organization. Russell was a member of the Boy Scouts of America for 40 years and the recipient of the highest award that a leader can receive called the Silver Beaver. Scout Master of Troop 3 (1956-58); Troop 276 (1974-76); Boy Scout District Commissioner, Crescent District, and Muskhogea District. He was President of the Parents Club of Annunciation Grammar School and National member, Louisiana Employer Support of the Guard and Reserve. He was a Volunteer at the 122nd Jackson Barracks Military Museum. His Military Schools included: Merchant Marine Academy, U.S. Army Officer Training Course, The Air Defense Basic & Advance Course, Army Transportation Course, Army Engineer & Quartermaster Courses and U.S. Army Command & General Staff College. 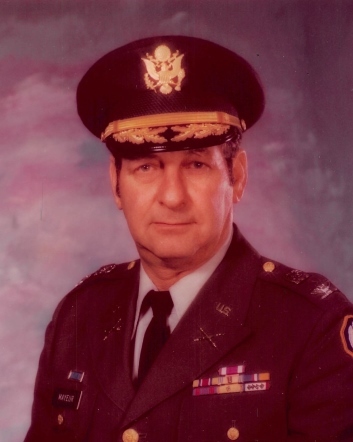 His awards & decorations include: U.S. Army Meritorious Service Medal, WW II Victory Medal, Atlantic and Mediterranean War Zone, U.S. Army Commendation Medal with Device, National Reference Medal and Louisiana Emergency Service Medal. He served in the VFW Post 2880 as commander for 5 years followed by 2 years as the post Quarter Master retiring in 2005. During the time prior to his death, he was a member of American Legion Post 377 and served for 2 years as the 2nd Vice Commander. Also, he served as President of Jackson Barracks Officers Club 1963-64, President of the LA National Guard Association of Louisiana 1980-81. President of the Washington Artillery Veterans Association for 3 terms.